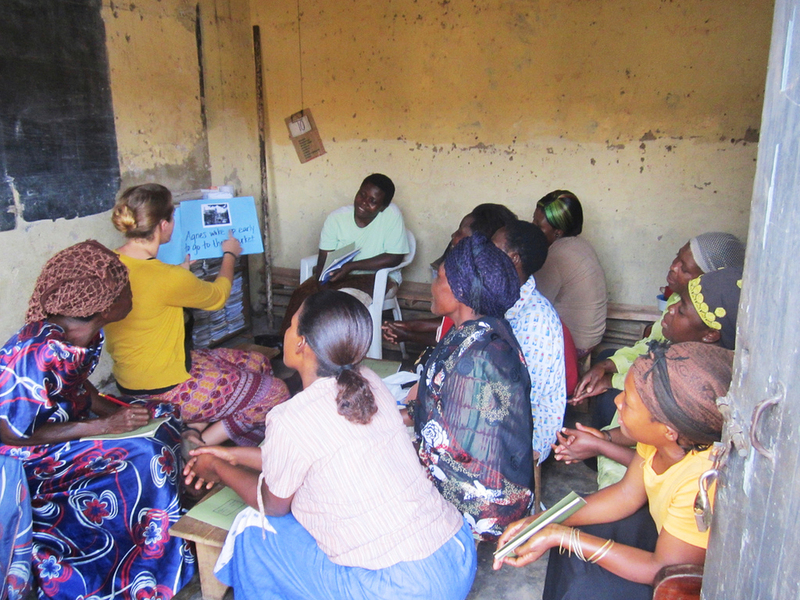 Ashley Moore teaches her women's literacy class in the Bwaise slum (located outside of Kampala) using a technique called "Big Book Literacy." The technique is used to help students gain confidence reading in the safety of a group. She created the book herself, using pictures and stories of every situations experienced in Bwaise. When I get off the taxi at the Bwaise stage, my mind immediately begins racing. I know what I will see, but it never gets easier. This begins with women on their mats, selling the exact same thing. I counted at least 15 people in a row selling bananas by the droves, knowing that each of them may only sell a handful of bananas. This is consistent with the fact that 80% of Bwaise’s population lives on less than $2 per day. I know I will see children chasing old tires with a stick, many of them with no shoes and tattered clothes. I will see families trying to make a life for themselves in Bwaise. That’s why people come to Kampala, to make a better life for themselves. I’m sure they never imagined living in a slum. Bwaise is one of the most deprived slum areas in the capital city of Kampala, housing over 30,000 people, a majority of the population being marginalized youth and women. The organization Action for Fundamental Change and Development (AFFCAD) is trying to address issues that Bwaise residents (particularly women and children) face on a daily basis. I am volunteering with AFFCAD during my stint in Kampala. One of my major responsibilities is facilitating a Women’s Literacy Class (English as a Second Language). To get to the Excel Education Centre (the partner school of Action for Fundamental Change and Development [AFFCAD]) I cross a makeshift bridge to get to where the ‘homes’ are. The shanties are mostly mud-dung structures held together by sticks and a rusted tin roof of scrap metal. The water under the bridge is disgusting, filled with trash of everyday living (mostly plastics). I hate to think about what happens when it floods, as we’ve been told it often does in the rainy season. When I asked the headmaster at Excel about the flooding, he said that it ruins everything near the trench – houses, little ‘stores’, and whatever else is in the way. The Bwaise zone has a HIV/AIDS prevalence of 10%, including 103 children under the age of 15. Bwaise is a dark place, to say the least. As dark as it may be, there is a glimmer of light – a classroom full of women who are ready and eager to learn. Every other day at 4:00pm, seven precious women wait for me to arrive, anxious to learn how to read and write. The hour is full of conversations (mostly greetings at this point), practical language skills practice and a lot of laughter. The class is designed to help these women participate in a society that observes English as the national language, making it difficult to complete tasks like filling out forms or speaking with foreigners (other African countries or Westerners). Most of the women have small businesses, making these conversational and reading skills even more necessary. These women light up my day with their vitality and enthusiasm to learn and participate in their own education. Newer PostWhat Motivates Health Care Workers?